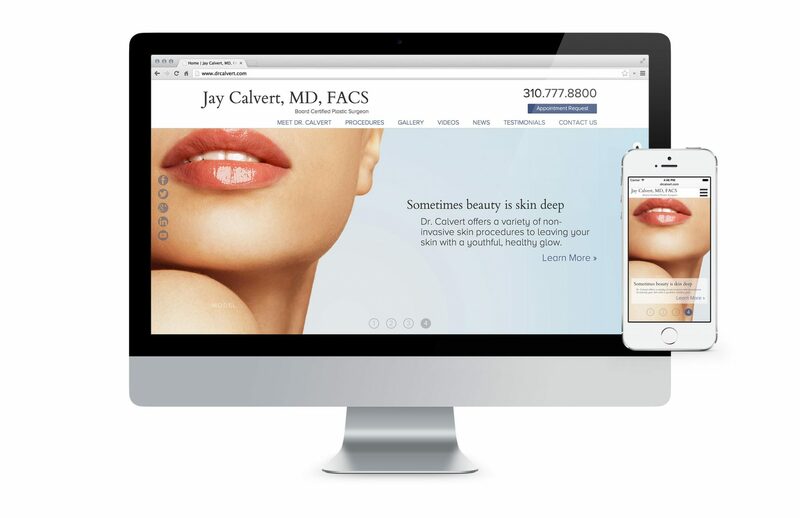 iSimplifyMe helped Dr. Jay Calvert transform his online presence to showcase the sophistication of his work. Dr. Calvert’s goal was to create a plastic surgeon website that was dynamic without sacrificing the capability to be self-managed. He wanted to be able to easily update pages (adding new events, articles, and gallery photos) to maintain a current, fresh look to his site. Additionally it was a priority to include “retina” images to attain the most high-quality graphics. After assessing his needs, it was decided to build the site entirely on a WordPress CMS and create a highly visual experience for visitors. 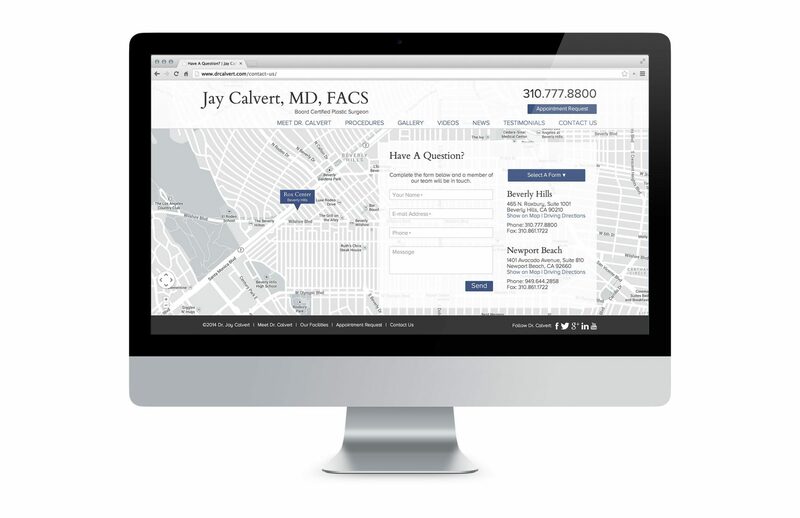 The homepage of Dr. Jay Calvert was designed to be visually striking with intuitive navigation. Our focus was to ensure that site visitors could easily find and access the main elements of the site, such as services offered and patient galleries, while also learning everything they’d like to know about Dr. Calvert himself. To accomplish that, we created a dynamic splash page that features parallax scrolling with a combination of CSS and jQuery. The polished images and emotive copy reinforce and extend Dr. Calvert’s online identity. 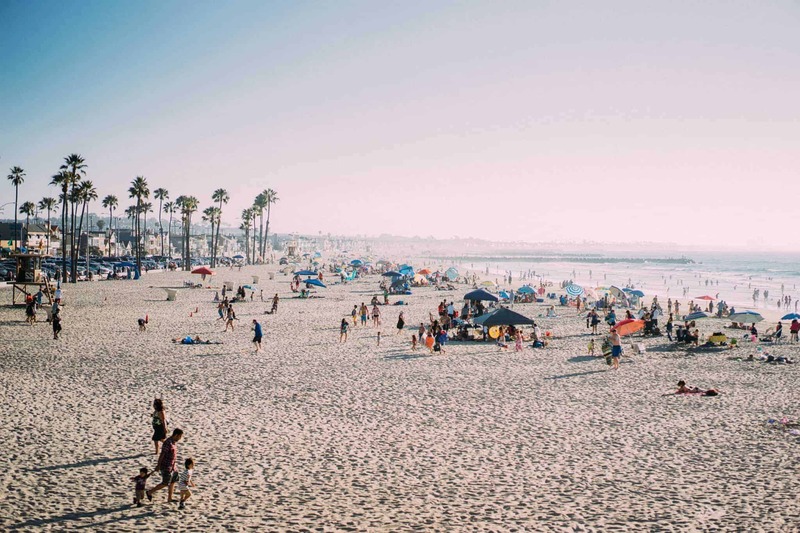 The gallery was given a considerable amount of prioritization throughout the entire website design process—in Dr. Calvert’s industry, galleries have proven to be the most trafficked pages with a high degree of influence over visitors. A full-sized, elaborate gallery with a clean scroll showcases before-and-after images of patients, clearly illustrating Dr. Calvert’s ability and skill. The testimonials section, another highly influential page, was designed to be dynamic to allow patients to easily relate and publish their experiences. The concept was to convey the importance of feedback to patients while simultaneously engendering trust in new potential clients. The videos page was included in the website to act as consolidated library of Dr. Calvert’s social and training videos. This page highlights Dr. Calvert’s established expertise with personalized videos explaining his philosophy and approach to various procedures, as well as guest appearances on shows such as The Tyra Banks Show and The Doctors. The news & events page allows visitors to scroll through upcoming and past events on Dr. Calvert’s schedule, including seminars and trainings. Also included on this page are Dr. Calvert’s latest educational articles, helping site visitors learn about him and his experience, in his own words. The contact us page integrates a full-screen map using a Google Maps API key, which offers a view of the multiple business locations. A form submission allows visitors to easily submit any questions to Dr. Calvert and his team.